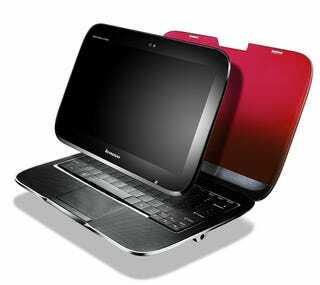 Lenovo's IdeaPad U1 is quite the clever combination of multi-touch tablet and laptop. When you ditch everything but the screen for the slate-like tablet section, the device is to switch processors and operating systems. Oh, and it's gorgeous, too. When both halves of the U1 are together, it runs on Windows 7 on a Intel Core 2 Duo SU processor, but when you split them up, the tablet will use a custom version of Linux and a Qualcomm ARM Snapdragon processor. This means that you'd be getting the best combination of power and battery life for each scenario. Other than that neat setup, the U1 brings 4GB of RAM (512MB in slate/tablet mode), two USB 2.0 ports, eSATA, VGA, HDMI, 4-in-1 memory card reader, and a 1.3-Megapixel camera. Not too bad for about a thousand bucks. Lenovo will start selling the hybrid in June, but in the meantime I'll be left wondering if it is really the best of both worlds wrapped in a pretty package or yet another half-hearted combination device.